Being free to move and develop onebs projects and dreams without boundaries is an ideal that performing artists depict through their work outputs, practices and profiles. However there is a distance in between this freedom as an aspiration and artistbs actual ability to move and create across borders. The promise of mobility captures this prospective freedom. 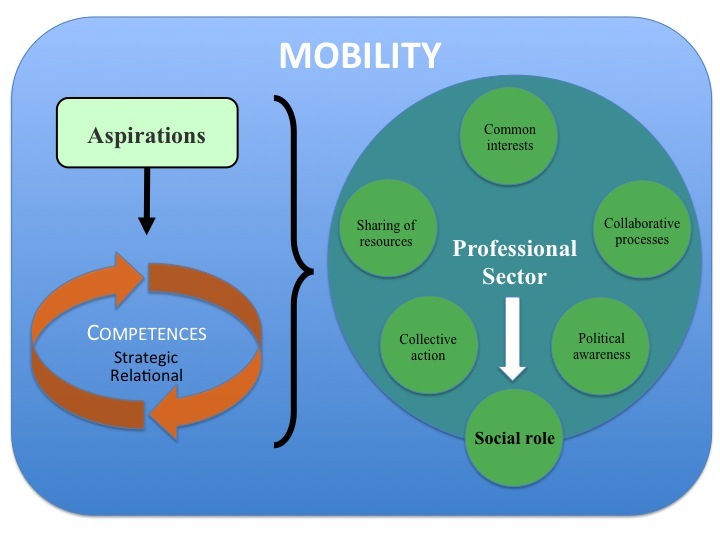 Different than movement, mobility is a potential that depends on the conjugation of individual and institutional aspirations and competences. The concept of mobility is transversal and multiple. It may imply physical and/or virtual movement, yet it actually takes place at the level of mind-sets when interaction across diverse categories occurs. When performing artists speaking various languages or representing diverse disciplines or professional profiles come together to collaborate across these differences. Thus mobility can take place at the world scale, in Europe, just inside our hometown or within our own mind. 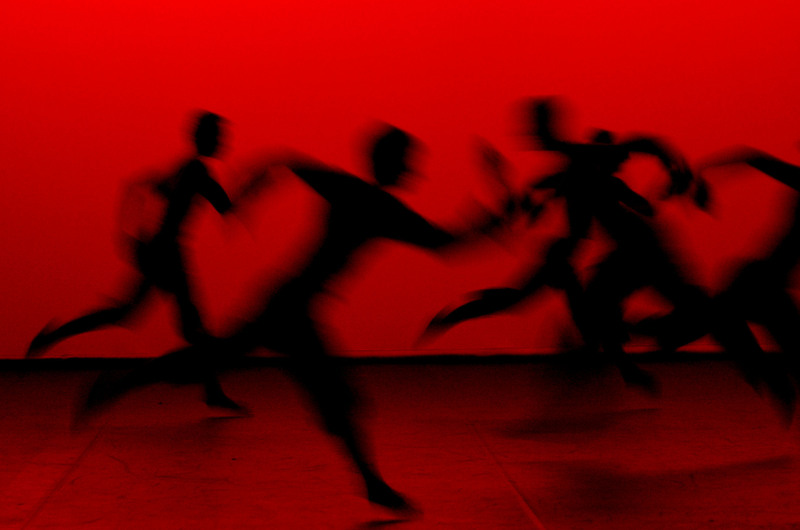 The above scheme intends to illustrate mobility requirements and consequences at individual and institutional level in the performing arts sector. As a potential, mobility operates like a resource in itself, which access and benefit depends on the possession of suitable resources or capitals. In this respect, mobility can either be a resource for wealth and happiness or for precariousness and sorrow. Nowadays societies have turned mobility into an increasingly panacea, reflected in different dimensions, from economic globalised labour markets to the EU political integration project. In the case of the performing arts, mobility moved further from a desirable career aspiration and artistic option to become an essential feature of the market re-structuring this professional activity. Thus mobility turned into a demand for all those that wish to survive, be integrated and successful. Performing artists are therefore confined, bound to engage in mobility throughout their careers. As artistsb freedom to move and create has been nurtured on the lack of national and professional regulation and consequent absence of a proper social status, the downside is that artists are being drawn into a European scene without safety net. Therefore, artistsb ability to put forward plans and dreams and take the stage and perform in the European scene is dependent on individual educational, economical and social backgrounds and profiles as well as institutional frameworks that shape their projects and action. As the institutional map of Europe is unbalanced, economically and politically, drawing up quite different expectations and resources, mobility might mean either wealth or precariousness within an artistbs path. Despite the EU ongoing integration process envisaging coordination of national policies, member-states hold responsibility over areas such as taxation, employment and social affairs that structure labour markets at national level. Therefore EU freedom of movement operates within a puzzle of different national labour markets. Nevertheless there are common trends and features that define as well in parallel a transnational entity, the EU labour market, an enlarged space for work that this paper concentrates on capturing. To engage in mobility in this wider and more complex scene, artists are required to go further and associate their art (technical competences) with strategic and relational competences that gradually imply changes to their practices and profiles and at the end of the scale to their artworks too. Moreover, mobility offers a specific setting that shapes and imposes requirements to individuals when putting the above set of competences into action. Mobility requires individuals to transit through and act within multiple frameworks, be those of language, culture, professional practices, artistic disciplines or national administrations. In order to take advantage of diverse opportunities but also to overcome obstacles, artists need to know how to combine different roles and belongings; to live and hop from one community to the other; to relate to different partners. In this logic, artists need not only to master technical, strategic and relational competences but also to be able to put them into action in a dynamic and articulated way within a project development perspective. When going from the individual to the institutional level, looking at the performing arts as a sector, the general atomisation of professionals and social vulnerability make access to mobility a hard job. Only those few holding adequate resources can strive. The sector when poorly regulated and randomly organised does not provide a favourable environment for handling mobility. Against all odds, along this strenuous way of learning by doing, performing artists end up meeting each other, sharing resources, collaborating and developing joint processes thus amplifying perspectives and competences. The European stage and the valuable support of new digital technologies have been setting the scene for the gradual development of communities of interest and practices materialised around formal and informal organisations, networks and platforms at national and European level. These organisations are paving the away for the development of the sector collective organisation and alongside the increase of political awareness and collective action. In this process artists are taking up a more engaged stance and role towards economical and social frameworks and linking to other sectors and fields of society. Nowadays there is a gradual involvement of art organisations along other civil society organisations in political debates such as labour conditions, social justice, migrations, cultural diversity and the environmental agenda, among others. The sector develops awareness and practices to see its social role recognised beyond the mere stage spotlights. However collective organisation and action is still embryonic as participation and commitment to these organisations is reliant on limited resources. Lack of adequate competences but also limited institutional conditions lead to the reproduction of social and economic inequalities within the field. Capacity building of artists and their organisations is crucial to enable the sector to be more efficient and successful in acting within the European space. In this respect, the combination of technical, strategic and relational competences is determinant. Therefore the sector ought to value the learning of this know-how alongside its sharing and coordination. In parallel, these developments need to be monitored and transferred into curricula so education and training match the current European work environment. Moreover in what comes to competences, access and management of information, most especially at the digital level is of key importance. Artists and organisations need to make it a permanent concern and integral feature of their missions and working practices. Professionals have to make visible their actions and experiences so to better and systematically share and exchange their know-how with others. Alongside the work between arts and media professionals would contribute to steadily widen access to information and foster a European public space. Digital tools are optimal media to develop group forming and professionals shall get acquainted with these instruments and be able to take the best out of them. The virtual is a language and an art in itself capable of generating new thoughts, roles and practices about art and interactivity and its relation with other fields and audiences. It allows innovative collaborations and participation of people with limited capacities and/or travelling constraints. Finally, artists' specific working needs and social rights under a mobility frame need to find an adequate environment at the European level. As a matter of fact current global labour market challenges cannot be dealt at the national level solely. Among them stands the need to ensure a stable common ground for individual flexibility and mobility to be nurtured. To set this agenda forward, EU member-states need to improve the portability of citizenbs rights and duties throughout the Unionbs territory and simultaneously adapt institutions to multiple job holders mobile professionals. These changes shall have in view the set up of a European social status for independent professionals in which artists would see their profile and specific working conditions considered. The need to ease visas and work permits for non-EU citizens travelling to and living and working in the EU should also be taken into account so to enable circularity of movements and free exchange with the rest of the world, most especially with the EU neighbouring countries at east and in the south. These measures would allow developing an attractive, open and sustainable European labour market for performing artists. Moreover this framework would be transferable to other intellectual and creative professionals, as nowadays their profile and fragile working conditions are getting similar. Precariousness is nowadays shared among different professionals despite high qualifications. Ulrich Beck calls them "united in decline" . Actually the development of a common space for creation and dissemination of art processes and works in Europe is dependent on an increasing interaction and dialogue across all fields of society. It is commonly assumed that hindrances to performing artistsb mobility lay in legal-administrative barriers, yet other important barriers touch individual and institutional aspirations and competences. The capacity to access mobility relies on the resources held by individuals at the economic, educational and social level; but also on societies to create the adequate environments for these resources to flourish. Though mobility in the EU is a citizenbs acquired right-freedom, its access remains unequal because it tends to reproduce and mirror previous economical, political, social and cultural frameworks. The enlargement of access to mobility requires developments at institutional level that would affect at longer-term individual aspirations and profiles, most especially concerning the education and training domain. Yet change at this level is reliant on a more consensual attitude towards mobility from societies and individuals. Here lies precisely the paradox: mobility is considered either a great chance or a terrible threat. These mixed feelings and fears towards mobility processes and consequences result in contradictory measures and policies. Mobility encloses many hopes and dreams but also suspicions and threats. The emancipation promises it drags along are pursued heartily by some, among them many artists, yet also feared and rejected by numerous others. The main paradigm mobility puts into question is the nation-state and its institutions. In the European continent, nation-states remain the dominant paradigm in the organisation of citizensb daily lives and projects. Despite the EU project shy advancements, there is a lack of coordination at key policy fields that hinder mobility across member states. In parallel, the lack of progress at institutional level is also mirrored by a tiny presence in the national media and public space. The latter together with education and training systems are determinant to the process of feeding aspirations and building up competences. If mobility is hardly present in these environments then mind-sets and horizons are not pushed further. The investment in digital literacy and access also plays an essential role in this course. Actually the claim for the fifth freedom, the freedom of knowledge to be added to the four original principles of free movement of persons, capital, services and goods in the EU needs to go beyond the academia sphere to integrate information in general as knowledge. When approaching cultural dimensions, interaction and coexistence within diversity remains difficult. Competences in this domain are not generalised, as the ability to master different languages and to act within cultural diverse backgrounds. Fruitful communication does not happen per si especially if the public is confronted with art works without a familiar context. Artists and artworks may have a role to play to promote participation and dialogue with audiences. Yet in turn, audiencesb contribution in interpreting and re-creating further art pieces shall also be recognised and valued, so cultural diversity may become a source of learning. Otherwise at the same time that cultural diversity and intercultural dialogue are celebrated officially and cultural cooperation slowly gets into the diplomatic agendas, the fear of the stranger and the other grows within the very heart of European societies as nationalistic movements are on the rise. The issue of migrations is another important dimension in which the chance vs. threat paradox is reflected. As EU population diminishes and ages markets realise the need for external supplies. Actually there are mismatches between the type of jobs available and the profiles and interests of the internal workforce. While the EU promotes internal mobility as a chance, member states in face of current raising unemployment, financial crisis and consequent discontent of populations, hinder entrance conditions to foreigners, as they would represent a menace to local inhabitants. In parallel the media helps to spread these fears and prejudices against outsiders. This national attitude is mirrored at EU level where lacks a clear common policy in this issue, producing contradictory messages in between promotion of mobility and inhibition of immigration. However, for member states to take this step further, an overall change of mentalities and attitudes in relation to migrations would need to take place. Consequently the whole concept of citizenship should be refunded alongside its legal implications and associated rights. Regulations are running behind actual practices, holding on to paradigms that mobility has been putting into cause. This action would imply adopting a common pragmatic and positive approach regarding the management of the different migratory flows  . European societies ought to acknowledge and manage their accelerated transition from national pretentiously homogenous groups to multicultural diverse. In the same line, there is a need to renew one-sided integration expectancies and policies to adjust to current circularity of mobility practices that drag along a multiplicity of belongings and responsibilities beyond the mere one-nation affiliations. A growing number of individuals nowadays hop from one community to another, physical and virtual, conjugating different identities and roles. Some are considered officially migrants, as they are living or working in a country different from that of their origin. While others never left their homeland yet still this multiplicity and transient identities characterises their lives. Thus societies need to reflect this flexibility, articulating these different spheres into their regulations and expectations in the same way, as they are already requiring them from individuals within their work. Simultaneously, in nowadays globalised societies new debates and practices question the impact of physical displacements, particularly those of the environment and the virtual world. Environmental impact, safety, new social movements contest precariousness and put into cause the mobility paradigm, bringing new questions in between risk and control. Actually growing environmental concerns are questioning current ways and means of travel and trying to impose restrictions to carbon emissions while creating alternatives that will necessarily slow down the pace. Virtual and green mobility are new territories where some artists attempt to be creative and explore further. It aims at creating a new awareness and attitude at times when mobility is high on the scale of values and a way of survival. In the same line, social movements question the skills and competences agenda to be highly dominated by economic goals such as growth, competition and employability. From this point of view education and training purposes are reduced to the requirements of the market responding uniquely to them and leaving aside the mission of individual and collective development and knowledge. In the case of the arts, this discussion is translated into the difficult relationship between artistic creativity and economic goals and the contesting of the promotion of cultural entrepreneurship and the creative industries. Within this intricate and paradox story full of contradictory aspirations, artists may have a very specific story and role to play. The arts sector needs to stand for its critical perspective and ability to question, re-interpret and propose new narratives and models but societies need to recognise and integrate arts for this specific contribution and provide it with adequate environment to flourish. In this dialectic, artists are confronted in between conditionings imposed by social structures to discipline risk b that mobility potentiates b and the urge to risk-take as a core element of a dynamic innovative society. As individuals and as a group they have to find their own way through this complicated scenario. In this impasse to set out the right targets and manage aspirations, the debate on competences is crucial. Beyond dreams and wishes, those who will be able to actually and effectively connect and act will make the difference. The study of artists' mobility mirrors the need for social scientists to work bacross borders - in the same way as artists. In a larger sense, social theory needs to redefine concepts and methods so to acknowledge social phenomena beyond national or single cultural frames. A transdisciplinary approach is fundamental to grasp multiple and interdependent facts, such as European mobility. In this process, it is important to re-structure ways of collecting and analysing data. Individuals do not necessarily fit into a single category any longer. To accumulate or change nationalities, citizenships as well as jobs became more ordinary nowadays. A static definition and division of categories, concepts, territories and disciplines may create obstacles to research within a cross-country environment instead of contributing to clarifying phenomena under study. At the empirical level, when approaching mobility most researchers face the lack of adequate instruments to measure and analyse circulation and practices across national borders and within the European space. Therefore there is the need to invest on reinventing concepts and tools and carry on long-term regular collection of datasets so to improve the quantitative awareness of the phenomena and in parallel deepen qualitative analysis narrowing the focus of analysis on specific categories and dimensions. Finally, to pursue further into this field of research, there is a need to involve and articulate the research community alongside authorities and statistic offices as well as the arts sector. All parties need to acknowledge the importance of research and embark on by giving it the necessary thought, means and action. The link between researchers and artsb professionals is crucial to develop suitable frameworks to collect data and study the sector's mobility processes and outcomes taking into right account its specificities. Moreover, this bond would increase the arts sector's reflectiveness by developing a proper monitoring and evaluation system to progress in the understanding of artistsb mobility needs, notably at education and training level as well as employment and social conditions. . .
Cristina Farinha. With a research background in Sociology, she works from the north of Portugal to the European stage in the field of culture and governance.B At the moment, based in ADDICT-Creative Industries Agency (Porto), she strives to promote capacity building, interaction and international cooperation among the different agents of the creative environment. .
[*] This paper is based on the conclusions of the PhD dissertation in Sociology of the author, "Bound to Mobility. The building up of a performing artists' community in the European Union", conducted in the HKU-Utrecht School of the Arts (NL) and awarded by the University of Porto (PT) in 2012. ONGHENA, Y. (Coord.) (2008) Boundaries: Transience and Intercultural Dynamics, Revista CIDOB dbAffers Internacionals, n.82-83, September, Barcelona: CIDOB b Barcelona Centre for International Affairs.